Looks great! I'll have to try this. I made this the other night using a 2 pound pack of stewing beef so reduced the time to 22 minutes but I'd go to 18 next time as I think it was overdone. Made the meat and sauce the night before and just rewarmed then next day and assembled the enchiladas. This was a hit. I made this the other day and it was delicious! It's the one I posted on the FB page. I omitted the bacon when I made it just because I didn't have any, and it was still awesome. I made this twice too based on your f/b post. I used bacon the 2nd time but that batch is in the freezer for another day's meal. We really enjoyed it and I'll make it again. Had never made short ribs so was new all around. I tried the http://www.pressurecookingtoday.com Thai Chicken thighs the other night http://www.pressurecookingtoday.com/pressure-cooker-thai-chicken-thighs/. Add 1 tablespoon oil to the pressure cooker pot, select Browning. When oil is hot, brown the meat in small batches, do not crowd the pot. Set the browned chicken on a platter. When all the chicken is browned, add chicken broth, peanut butter, soy sauce, cilantro, lime juice, red pepper and ginger. Stir to combine. Add the browned chicken to the pot, along with any juices that have collected on the platter. Cover pot and lock lid in place. After 9 minutes cook time, turn off pressure cooker and use a quick pressure release. Remove chicken thighs from the pot leaving the sauce. In a small bowl, dissolve cornstarch in 2 tablespoons water. Add cornstarch mixture to the sauce in the pot stirring constantly. Select Simmer and bring to a boil, stirring constantly. After sauce thickens, add chicken thighs and coat with the sauce. Serve garnished with chopped peanuts and green onions. If you're using a natural peanut butter or if your sauce is too thick before pressure cooking, add additional chicken broth. If using natural peanut butter, you'll need to add some sweetener to the recipe. Carey's notes about the recipe: I think the sauce needed some garlic. I also thought the soy sauce was way too strong. Between it and the chicken broth this was salty. It really just tasted like soy sauce mixed with peanut butter when I first opened it up and tasted it. So I finished it with quite a bit of Sriracha, more lime juice, and a couple tbsp of brown sugar (which I expected to do as I used natural peanut butter). Even still, it was just ok. With steamed broccoli it was a 6/10 weeknight meal, with easy cleanup. I'm giving more thought to tweaks because of the easy factor and because Chris said that he liked it in theory, if not exactly in execution. Carey's notes about pot in pot rice: I did jasmine rice in a 1 quart souffle dish as a pot in pot on my trivet. 1 cup rice to 1 1/4 cups water. Salt, and a pat of butter. Uncovered. It was pretty good, but not quite as fluffy as my normal method (I was too lazy to rinse the rice, so that would probably have helped). But here's my advice: the pot in pot gets SLIPPERY from the grease splatter that comes up from the boiling sauce. I have silicone oven mitts and had plenty of room to get my fingers in to grip the dish, and it slipped like a greased pig out of my hands and crashed back down into my pot (didn't break thank goodness!). I ended up having to wiggle it to the side of the pot so that I could get my thumb underneath it (worrying about scratching my pot the whole time). Next time I would use a foil sling because I dropped the stupid thing three times before I was able to get it out. Last edited by cmd2012 on Thu Jan 12, 2017 12:24 pm, edited 2 times in total. Yeah, I'm finding the times are tending to run a little long in many of the recipes I've tried. Glad to hear that the short ribs turned out for you! I have some in the freezer, along with a batch of the Asian Short ribs. Both will end up on rotation here too (although short ribs used to be cheap, and now they're $$$!). Bring broth to a simmer on stove. Place Removable Pot in Pressure Cooker. Add butter. Press the COOK MODE Button for BROWN. Press the START/STOP buttom. Cook onion in 2 tablespoons butter stirring occasionally, until softened, 3 to 4 minutes. Add rice and cook, stirring, 1 minute. Add wine and simmer, stirring, until absorbed. Pour in stock and stir to mix. Place lid on cooker. Slide Safety Lock to LOCK position. Turn the Pressure Regulator knob to PRESSURE. Press the PRESSURE MODE Button for HIGH PRESSURE. Press the COOK TIME Button until 7 minutes apppears on the display. cooking under pressure 7 minutes, the Pressure Cooker will beep three times. Press and hold the START/STOP Button until Red Indicator illluminates. the lid. Stir in the Asparagus, peas, cheese and parsley and salt and pepper. I made a batch of Lablabi - Tunisian chick pea soup. I used the recipe from seriouseats, adding a cup of red quinoa and a half cup of red lentils, since I like things thicker. I soaked the chick peas in brine for about 4 hours, rinsed, and put it in the Instant Pot, with 9 c water, then set it to 50 min. on manual, letting pressure release naturally. 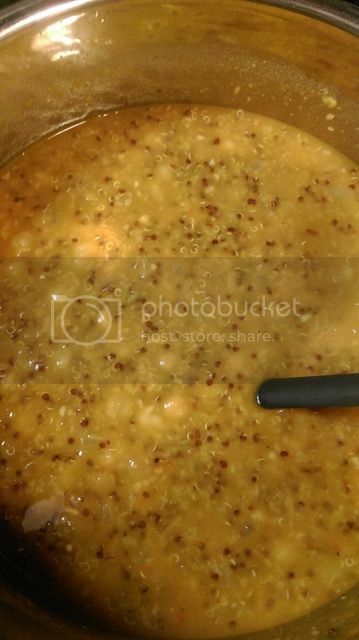 Meanwhile, I cooked the onion and garlic, with the cumin, and when the chick peas were ready, I stirred in the onion mash, quinoa, and red lentils, and set it to 10 more min. manual, letting the pressure release naturally. I added the lemon juice, adjusted the salt, and served with some of that harissa I just made (the reason that I made this dish. Another quick weeknight meal. The only change I made was that I followed hippressurcooking's time chart and did the thighs for 10 minutes with natural release. They were perfectly done. Also, I forgot to remove the skin. It was not an issue. They crisped up just fine under the broiler. Served with rice and veg. 1. Pat chicken dry with a paper towel. Combine 1 cup water and next 8 ingredients (through sesame oil) in a large bowl. Add chicken, turning to coat. Place chicken mixture in a 6-quart Instant Pot. Close and lock the lid of the Instant Pot. Turn the steam release handle to ͞Sealing͟ position. Press [Manual]; select ͞High Pressure͟, and use [-] or [+] to choose 17 minutes pressure cooking time. When time is up, turn cooker off. Open the cooker using Quick Pressure Release. (I did 10 minutes with natural release and it was perfect). 2. While chicken mixture cooks, preheat broiler. 3. Line a jelly-roll pan with foil; coat foil with cooking spray. Remove chicken from cooker with tongs, and place on prepared pan. Broil chicken 3 minutes on each side or until crisp and lightly charred. (I only cooked the skin side up). 5. Sprinkle chicken with scallions and cilantro; serve with sauce and, if desired, lime wedges. I find 15 minutes is about right for stew beef chunks. Looks like a good recipe!